Our Galaxy S8 case is made by premium flexible TPU material,non-slip with grip bars on both sides, embedded magnets for stronger hold. Stronger magnets for stable holding, flexible silicone clip for stable installation, 360°rotating stainless steel ball for angle adjustment and blue indicator lights to show the charging status. Holding your phone at the same time charging your phone in your car, providing a convenient experience when you are on the go. Hassle free mounting on the go, no need to apply charging cable, just mount your phone to the wireless charger. Stable and separate magnetic field won't interfere with the phone's magnetic field or signal, safe for your phone. Case magnets are strategically placed to not interfere with wireless charging waves.  Magnetic Wireless Charging -- Air vent mounted magnetic car holder, strong magnets to hold your phone safely while driving.  Strong and Versitile Design -- Charger has a metal swivel ball holder allowing a full 360 degrees rotation, giving you freedom to adjust the viewing angle of your phone. Cone shaped rubber clip protects your air vents from being damaged while mounted. 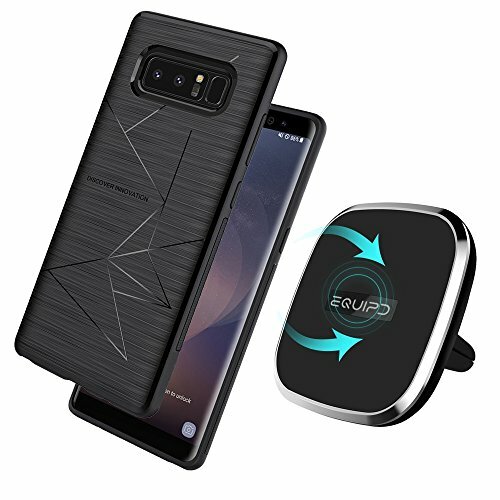  Qi Enabled -- The Qi Free Charger is compatible with all Qi-Enable devices or Qi recievers cases for wireless charging, this product is best compatble with Nillkin cases that have 4 built in magnets to perfectcly postition your phone for wireless charging.  The package includes 1x Qi Free Magnet case, 1x car magnetic wireless charger, 1x charging cable, and 1x user manual.Phone case has cutout to expose the speaker, jacks, buttons, camera, and prevents dust and scraping on the lens. NOTE* Please use our Qi Free Magnet case, It's specially designed for the Qi Free Charger . Our cases have magnets implemented to give strong hold between your device and the wireless charger. The use of other cases may not be compatible with our charger. If you have any questions about this product by EQUIPD, contact us by completing and submitting the form below. If you are looking for a specif part number, please include it with your message.